This is a quintessentially French dish with a classic cream sauce. It is rich, so small portions are adequate. 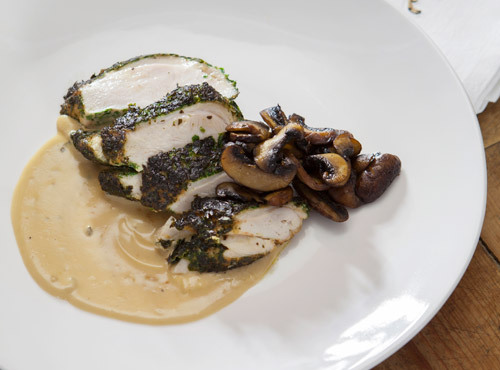 I have included very few dishes with creamy sauces in The Cook’s Companion but could not resist this memory of the Bresse countryside where the finest chickens are said to grow. Cut the breast fillets from a grain-fed, free-ranged 2 kg chicken and reserve the legs for another day. *To clarify butter, melt and simmer butter until the solids fall to the bottom of the saucepan, then ladle the liquid butter through a damp muslin cloth into a bowl. The clarified butter in the bowl will set solid and can be refrigerated, covered, for weeks without fear of rancidity. Sift paprika with flour. Season chicken breasts with salt and pepper, then dip into flour mixture. Spread parsley on a plate. In a separate dish, lightly whisk egg with oil. Dip each chicken breast into egg mixture, drain off excess and then press chicken breast into parsley to coat thoroughly.Gently heat clarified butter in a non-stick frying pan and cook chicken for about 8 minutes, turning every 2 minutes. Spoon over any juices that form in pan, then remove chicken to a hot plate and keep warm. Tip butter from pan into a small bowl and reserve. Return pan to heat and deglaze with verjuice and chicken stock. Reduce by three-quarters, then add crème fraîche and let it bubble and reduce. Check seasoning and keep sauce warm. Heat reserved butter in another frying pan and sauté mushrooms briskly until golden brown. Season with salt and pepper. Divide sauce between 4 plates. Slice chicken on an angle and place on top of sauce. Spoon mushrooms onto plate and serve at once.